Along with the development of this new pelmet system we have created a new Product Code Ordering System. Sizes are in 50mm increments. All you need is the window size, choose the style and size of returns. We have created an online program for your convenience that will calculate the code by in-putting your required sizes of your widow opening and returns, by default there will always be 100mm overhang of the pelmet on each side of the window. If you have a frame around your window then the window size is measured to the outside of the frame. Please refer to the How To Measure page. This system is great for the end user and retailer which makes it extremely easy to select a Pelmet. Label on the pelmets have all the necessary information required. Below is an example in part of a label's contents. Assuming you require a Pelmet for a 1200mm window opening, all you need to do is look for the style you like, in this case a Straight design. On the label you will see a line drawing of a window (1) which shows the window size of 1200mm and a straight design pelmet (2). Notice the 100 indicated on either side which represents the overhang on each side of the window. So just from this you can establish that the pelmet is suited for a 1200mm window opening that is a straight design and when fitted extend past the the window on each side by 100mm. A picture is worth a thousand words and can not get simpler than this. Listed also is a choice of returns (3). In this example 100mm is highlighted. There are different ranges of fabrics from A to D (4) that refer to different price groups listed on the label. All of this is designed to make shopping for pelmets as simple as possible and at a glance all the information is there to make the selection process and pricing easy for both the consumer and retailer. Measure your window - look for the label that has your widow size and style you like in the fabric range you prefer, pay for the goods, take it home where you can assemble it without the need for any tools, ready to be wall mounted in less than a minute. Wall mounting brackets are even supplied. You will also notice on the top right hand corner a product code (5) which is useful when ordering, as this is what our factory goes by when manufacturing. The product code tells us everything we require. 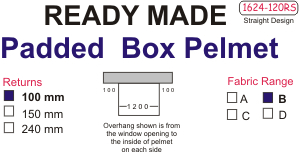 It tells us that this pelmet has 100mm returns. Works this way - Standard overhang is 100mm on each side of window total of 200mm, now add this to the window size of 1200mm = 1400 mm. the difference now being 224mm. Subtract 24 to give you a total of 200 = overhang being for 100mm on each side. This is a new concept and is working well. Please send us your thoughts and comments as they are important to us.